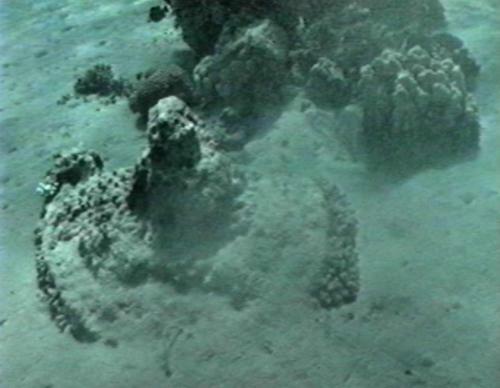 This update is actually a group of reports recounting a series of dives that have taken place at the Red Sea crossing site from May to September 2000. These dives have been organized and performed by several different groups that are working separately but cooperatively in an effort to further document evidence of this site. The dives have been of two different natures. The first have been salvage dives where attempts have been made to retrieve certain specific items from the sea bed. To this date there has not been much success in this area. 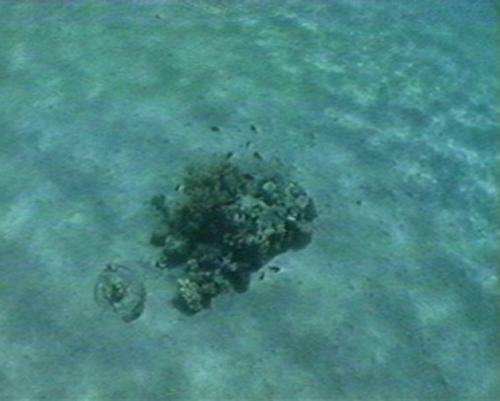 A few minor items have been found on these dives but nothing that could be removed. The second was a dive whose main purpose was to document and chart the contour and depth of the underwater pathway or “landbridge” which Ron Wyatt and his sons found in 1978. 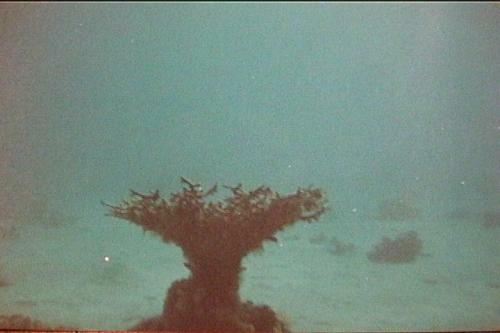 The first report is from the May 2000 dive where depth soundings were performed. Next is a series of photos of various items from the crossing site. The last part is a report from Ian Rodley who actually performed the depth soundings. 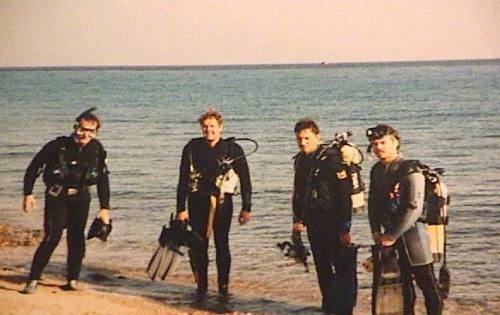 In May of this year another dive took place in the Red Sea at Nuweiba in order to continue the search for the remains of Pharaoh’s army. This dive was led by Mark Kransburg from Norway, and the divers included Ross Patterson from Australia, Viveka Ponten from Sweden, Michael Redman and Aaron Sen from Britain and Tor Larsen from Norway. We dove for seven days, and to our surprise our friend and colleague Dr. Lennart Moller was also in the area with a Los Angeles based producer and underwater cameraman. They were from “Discovery Media Productions” and had a remote-controlled camera that they were sending down to survey the coral covered artifacts in this area. After a few days, Jerry Harned the Post Production Supervisor and Joseph Condeelis the underwater cameraman, joined us on our boat to take additional underwater footage. They are planning on releasing their documentary video around January 2001. More information on this will be shared as it becomes available. Also on board was Ian Rodley from New Zealand who has much experience in the use of depth sounding equipment. He brought along his depth sounder, the “Simrad CE32 Chart Plotter” plus Global Positioning System, to carry out depth soundings along the seabed in order to chart its shape and layout. It is one of the most advanced small portable units around and to the best of my knowledge is still the latest model. We discovered that there is indeed an extremely gradual slope out to sea of about 1 in 14 as it goes out from Nuweiba, and about 1 in 10 as it rises back up to Saudi Arabia. Ian commented on how smooth the pathway was as well. Usually a seabed would be quite undulating, but we could see from the screen how easy it would have been for the Israelites to cross on such a smooth pathway. After returning from Egypt and evaluating information his company collected there, Jerry Harned said, “I have plotted a route across the Gulf of Aquaba from the Nuweiba side to the Saudi Arabian side that allows for an 8% grade. He said that his plot is based upon a recent depth chart published by Dr. John Hall of the Israeli Geological Survey.” He admits that his calculation method may be primitive and that the results need expert review, but they are encouraging. Below is a picture of what we saw on the depth sounder screen. It was very reassuring to see the results, and to see that the pathway really does extend across the Gulf of Aqaba at this point, as the presence of an under water land bridge has been strongly doubted by many critics. At last we could see first hand the underwater pathway. There are several different maps in circulation all with slightly different data, but our results corresponded closely to the Israeli map. Our results also made sense, in light of this comment from the Israeli Marine Geophysicist and Head of the GSI’s Marine Geology, Mapping & Tectonics Division. “In answer to your message to me via Ya’akov Arkin, there is a land bridge off Nuweiba. It rises to depths of slightly more than 850 m, with depths of greater than a kilometer to the north and south.” That made sense, as the ETOP05 satellite map and the British Admiralty Chart have since been declared inaccurate. Talking about the same formation other experts don’t call it a land bridge. For example the Marine Geophysicist, & Head of the M.G., M. & T. Division said bluntly, “Your land bridge simply doesn’t exist.” However, he doesn’t deny that the formation exists. Apparently the argument is, “does a 1/2 mile deep ridge constitute a land-bridge?” Either way, there’s no doubt anymore that there is a smooth pathway across the Gulf of Aqaba at this place with a very steep drop off on either side. 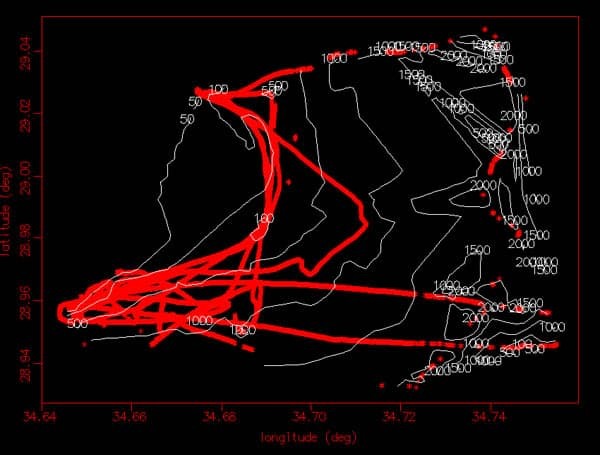 Below is the raw data showing the course we travelled while plotting. Where the red lines are clustered together at the bottom left, this is the southern bay where the diving has been taking place. The data is sampling at about 1 reading every two seconds. Below is a more useful picture, with the data superimposed onto a satellite photo. The different colours of the course data represent different depth ranges. If we had covered the whole of the area in a grid pattern about 100m apart, and this map was totally filled in; the depth contours would show up as coloured bands. But our main interest was checking out the slope of the crossing path, and the depth in the middle of the gulf. On May 5th we decided to take the boat directly toward Saudi Arabia, to wards the point where Viveka recorded on her GPS the location of chariot remains. As you will see in the picture, the course we took to Saudi was just slightly south of due east. As expected, we lost the bottom when the reading went over about 550m, as that is the maximum depth range of the SIMRAD. We let the skipper keep going to see how close we could get to Saudi, and we actually passed the half way mark! Then when the skipper felt we had reached the limit of how far he could go without Saudi permission, we turned north for about 1 mile, then turned west and plotted all the way back to Nuweiba. It was exciting to get so close to Saudi Arabia! 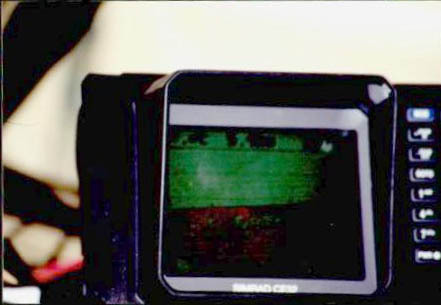 Because of the in built GPS, it was possible to pre-program a course into it, and the display would indicate if you are keeping to that course, or whether you needed to steer the boat to bring it back on course. This makes plotting in a grid pattern very easy. We had hoped to do a systematic plotting grid for mapping the depth contours, but as it turned out, the weather was quite choppy almost the whole time we were there, which was unusual. We dove with Minelab’s “Excaliber 1000” metal detector. It uses Minelab’s unique Broad Band Spectrum technology, which enables them to transmit automatically at 17 individual frequencies at the same time, and could penetrate about 2 metres below the seabed. On one dive at about 28 metres, we located a wheel shaped coral. It was the right size for a chariot wheel, and we could clearly see what would be the hub and 6 spokes. I signaled Mark to sweep it with the metal detector and he got a positive reading around the rim, but not the spokes or hub. 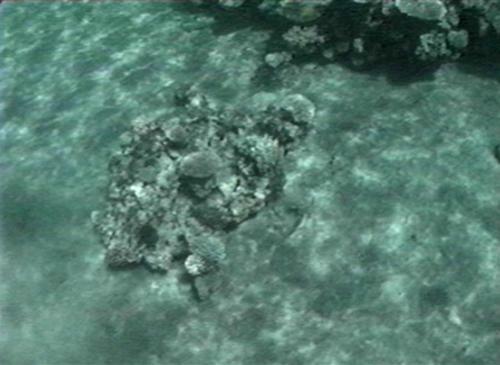 There was a good amount of coral growing on it, but the features were clearly visible. I tried to move it, but it wouldn’t budge. We also found tiny amounts of metals in various corals. 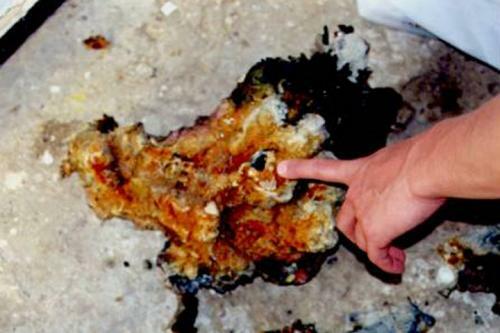 When we turned these corals upside down, we saw a great deal of very distinct rust colour, and the discoloration on the coral certainly looked like iron. This makes sense because if these were remains of the Pharaoh’s army, and have been lying around since 1446 BC, then a lot of the metals would have rusted away, leaving only tiny amounts of metal. We were all very happy with the results of this dive trip and saw how God had moved in this project to have Discovery Media Productions there at the same time. Viveka Ponten is traveling to California to assist in the production of their documentary, as she also has pictures of chariot wheels from the Saudi shoreline, and pictures of the Mount Sinai site that Ron discovered in Saudi. 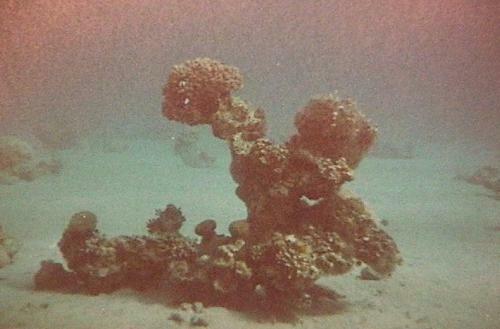 Below are some chariot wheel pictures that Viveka took on the Saudi side of the Gulf of Aqaba. We thank her for providing them. Below are some photos that Ronny Wyatt (Ron Wyatt’s son) recently provided me with. They are from years ago and include one with Jonathan Gray and Ron Wyatt. 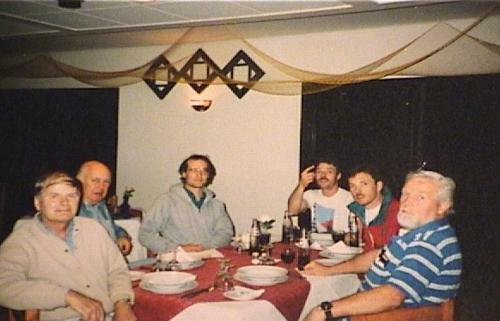 I was in Nuweiba with Aaron Sen, Ross Patterson and others in May 2000 and did depth soundings which, I believe, confirmed the accuracy of the Israeli Marine Geology, Mapping & Tectonics Division bathymetric chart. This chart shows a maximum depth of around 800 metres along the crossing site. Unfortunately my equipment reached a depth of only 500 metres because of the high salt content in the Gulf of Aqaba (my echo sounder would normally reach depths down to 800 metres). I do not accept that a ‘landbridge’ exists but there is most definitely a ‘pathway’ in the sea with gentle slopes of around 1 in 10 to 1 in 14 gradient. We traveled in a due east direction from the Nuweiba bay to the Saudi coastline and clearly identified the ‘pathway’. We traveled more than halfway across but we lost readings beyond 500 metres. I hope to return to Nuweiba sometime later this year with a more powerful echo sounder to confirm and extend the survey we did in May. A group in the United States are presently doing an analysis of our sounding data in conjunction with the Israeli bathymetric chart and other information they have obtained about the sea bed in the Gulf of Aqaba region. The results look very interesting. 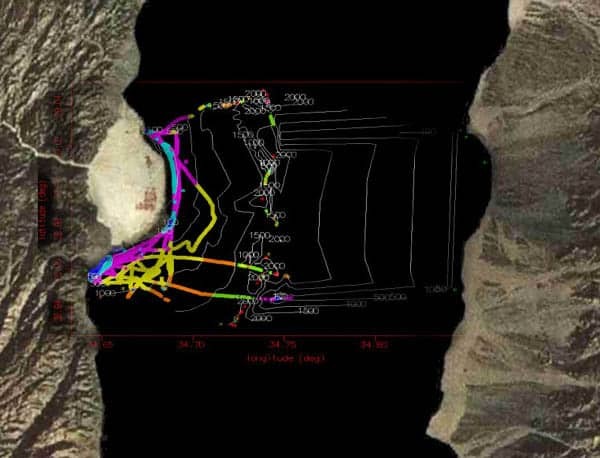 To date, the results confirm a ‘pathway’ with gentle slopes at only one point in the Gulf of Aqaba – east from Nuweiba Bay to the Saudi coast. I believe we confirmed the accuracy of the Bible on 3 counts. 1. The crossing pathway is in a due east direction – Exodus 14:21. 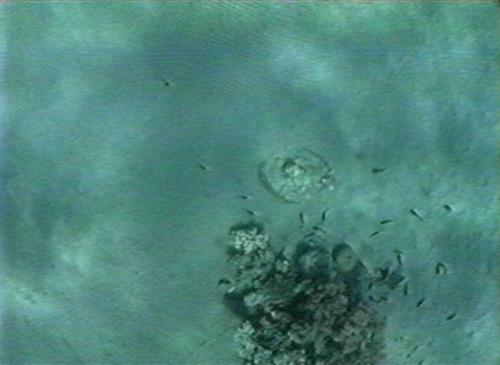 The Saudi coastline waypoint is due east of the Nuweiba Bay – a diver (Viveka Ponten) located chariot parts and a shallow drop-off on the Saudi side. This is confirmed by the Israeli chart. 2. God provided a roadway on the seabed that could be easily traversed. 3. 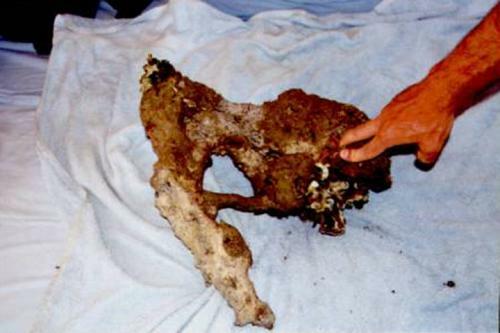 It was very deep – what a miracle! You can understand why the nations trembled. I’m convinced about the amount of evidence that proves the authenticity of the bible. Thanks for confirming my faith in the holy bible. God bless you Mister Patterson.